Remember I mentioned there would be a one week reprieve from fish? Well, this is it. For Cooking With Stanley this week, I have a delicious brunch I made for Father's Day. This, of course, can be made any weekend, or even day of the week. And if you learn from my mistakes, it will be super easy. Despite my minor screw ups, everyone loved this meal. 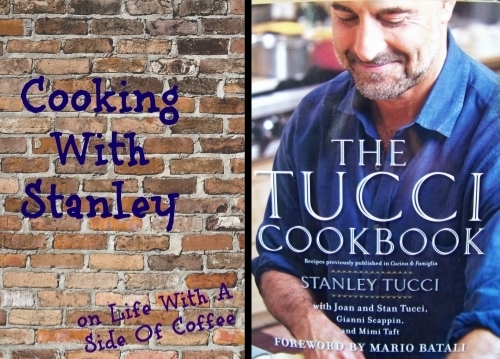 As you can see, Cooking With Stanley had a few outsiders this week. I wanted to have a well-rounded brunch and not just eggs and toast so I added a few things in. Starting with the main, the Eggs with Peppers is a frittata. This was the first time I made a frittata. I've never attempted them for two reasons. 1) I don't have a cast iron skillet to pop in the oven. 2) I am too afraid to flip them on the stove. The frittata I made fed 5 people. I used a total of 10 eggs and the largest pan in my kitchen. I tried flipping the whole thing a million times in ten different ways. I tried using the largest spatula, tried using two spatulas, tried folding it. I even debated taking another pan, setting it on top and then flipping them to get the eggs on the new pan. I decided that would have made a mess. So how was I going to get this thing flipped to finish cooking? I cut it in half and flipped each side separately. You laugh but it worked. It was going to get cut in half eventually anyway. I just think it's ridiculous it took me that long to figure out a solution. Minus a few burned bits, it turned out pretty well! It didn't look very good but presentation only goes so far...right? The night before, I whipped up some walnut bread. I thought this was going to be more like a sweet bread like banana bread or something but it was actually just a normal bread made with whole wheat flour and walnuts. I'm pretty proud of this bread because it was the first one I officially made 100% by myself. No one helped me with the yeast, no one helped me knead it. I did all the work and it turned out pretty well. It's fabulous with jam spread over it. You can take this recipe and make it your own too. Instead of walnuts, you can make it a tomato and olive bread, add in some dried fruits. Whatever floats your boat. You can't have brunch without some kind of meat. Right? I picked up some breakfast sausages from the store to round the meal out a bit more. We had regular ones and chicken apple sausages. They were amazing. I think my papa was originally turned off by the chicken apple sausages but he loved them. I also whipped up some muffins that morning. Me and my grandparents are the only ones who eat anything with nuts so I wanted to have a bread option for my aunt and mom as well. The Cinnamon Sugar Muffin recipe I've had for a while from Center Cut Cook sounded like the perfect option. We all had one. Instead of dipping the muffins in melted butter than a cinnamon sugar mix, I mixed the butter, cinnamon and sugar together. It was a total accident but it worked out perfectly. They were to die for. So what do you think of the latest Cooking With Stanley? Let me know if you try those muffins. They're so good! Get ready for two more weeks of fish, another reprieve and then three final weeks of fish. We'll be done for a while then. I can't wait to get back to hearty pastas and to try some other meats. Before you go, I have a promo code for Windy City Smokeout July 10-12 in Chicago. Enter LWASOC at checkout to get a 3-day pass for only $60 until tonight at 11:59pm CST. Don't miss out! That's a steal.